Primary Possibilities: Word Collection Fun! You know how kids love to "collect" things... especially at recess- rocks, bugs, sticks- you name it and you have probably had them try to "collect" it. 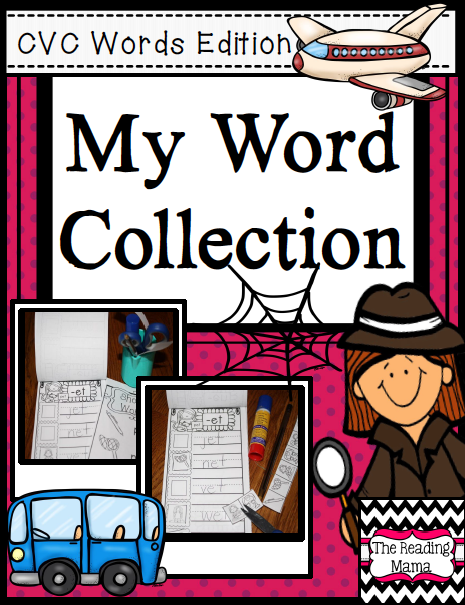 So I was excited to be able to use this word collection printable from The Reading Mama. First, you easily assemble the book which is all in black/white (easy on the ink). It is also a half page booklet and can be printed front-to-back (easy on the paper). Students "collect" words as they work through word families or short vowels. They can use the pictures provided or they can add their own words and draw a small picture of the word. I had my students place these in their book boxes so they can look at them, read them, and add on to them anytime they want to. They were so excited to be able to have their own little collection of words that they can read! You can grab up this product HERE at The Reading Mama's store or by clicking on the picture below! What a creative and wonderful idea! Smiles and stop by anytime!